What began with four women organizing local teach-ins and rallies in Saskatoon, Saskatchewan, last fall has grown into a global grassroots movement of indigenous and non-indigenous allies fighting for the sovereignty of indigenous people, the honoring of treaty rights, and the protection of land and water. Because these communities are determined to fight the exploitation of natural resources that is resulting in climate change and other environmental crises, their cause has the potential to impact the whole world. In October, Sylvia McAdam, Jess Gordon, Nina Wilson and Sheelah Mclean met to strategize about how to spread awareness of Bill C-45, then being debated in the Canadian parliament, and to prevent the proposed legislation from becoming law. 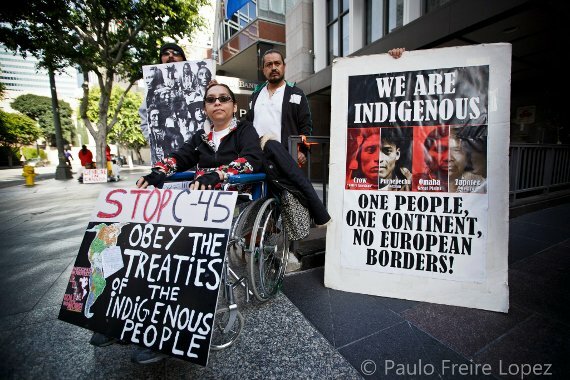 Many First Nations tribes have held that bill C-45, along with 14 other pieces of related legislation, threaten First Nations sovereignty and violate their treaty rights by altering the Indian Act. These changes would result in granting the Canadian federal government increased control over the land, rivers and lakes on tribal reservations, in many cases for the sake of mining, fossil fuel harvesting and corporate profit. The Canadian government for the most part did not include indigenous representation in the decision-making process. Idle No More has organized widespread demonstrations and flash mobs, and some individuals have participated in highway blockades and interruptions of the legislative process. Attawapiskat chief Theresa Spence has been on a sustained hunger strike since December 11 in protest of the plight imposed on indigenous people. Chief Spence has said, “I am willing to die for my people because the pain is too much and it’s time for the government to realize what it’s doing to us.” The First Nations activists’ self-determination through direct action is inspiring what could become a movement of indigenous communities across the globe. From Nicaragua, to New Zealand and Australia, to Palestine, to Hawaii, people have demonstrated their solidarity with the Idle No More movement. At solidarity actions across the United States, people are not just discussing the social and political repression experienced by indigenous people in Canada; they are voicing the pain that indigenous people in the United States endure because of similar treaty violations, because of the colonization many claim they still experience, and because of the destruction of land and water due to the policies of the U.S. government. Idle No More protests have been held in at least 36 locations in the United States, including Arizona, Florida, Maine, North Carolina, Oklahoma, New York City, California, Seattle, and Minnesota — where over 1,000 people rallied at the Mall of America on December 30. The spirit of Idle No More is continuing to spread. In Hawaii, an “Idle No More: We the People” rally will be held at the state capital on January 16, demanding that the rights of native Hawaiians be honored and recognized, and that the land, oceans and food be protected and kept GMO free. Similarly, an Idle No More protest in Flagstaff, Ariz., on January 8 expressed solidarity with the First Nations movement in Canada, but was centered on local issues in their community as well — in particular, a nearby ski resort that uses harmful chemicals to make snow. Organizers are calling on people of all backgrounds to join the struggle for indigenous rights and the protection of the planet. This has led to growing ties between the international environmental movement and indigenous activists. On January 2, organizers of the Tar Sands Blockade against the expansion of a piplelines intended to carry Canadian tar sands assembled two “dump platforms” in Texas, which two blockaders are sitting upon in solidarity with Idle No More. I am part native indian and have never lived on a reserve. I have lived in “white” Canada all my life, yet in the last 6 years have experienced the worst kind of racism from a doctor in the lower mainland who has ruined my life. So if ever there was a cause now is the time because racism exists in Canada in a big way, and it will take all of us to make a change. So show up in numbers, don’t be lazy, get out and be active to make this change for future generations. * In response to the big Idle No More Facebook page’s posting of this article, people are raising questions of the limits of nonviolence and the possible necessity of violence (responding, it seems, solely to the name of this site, since the article itself doesn’t address this issue at all). * At the event page for today’s NYC solidarity event, there are concerns expressed about having non-native people at the lead, appropriating native traditions. PROTESTING TONIGHT IDLE NO MOREEEE!!!! UM, AREN’T THE JEWS MORE INDIGENOUS THAN THE ARABS? THEY HAD A TEMPLE THOUSANDS OF YEARS BEFORE THE ARABS MIGRATED IN.